The low cost laser pointer. 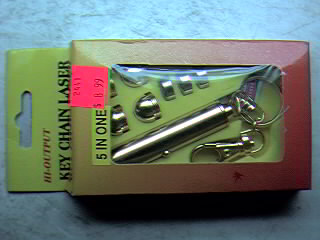 This is the lowest priced laser that I have seen. Bringing out the hidden power of the laser. Half to two thirds of the power never makes it out of a stock laser pen. 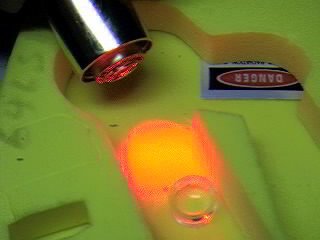 This operation also a way to make the laser "child safe" because it prevents the "child" from pointing the beam at the police and other people. Yet it still allows the unique qualities of the laser light to be appreciated. 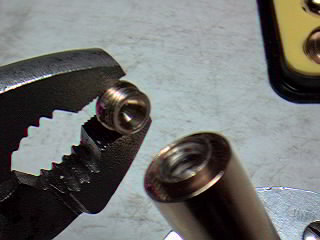 This is the lens that intercepts and straightens out the center third to as much as a half of the normally spreading beam of the laser diode. 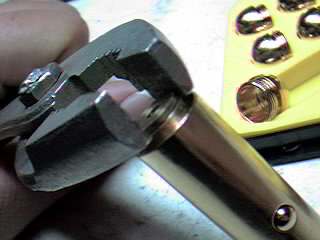 The flatter side faces the laser light source. These three parts can be placed in a location that is secret or locked away until the "child" learns to play with a beamed laser safely. This is the last part to emerge from the laser beam collimator space. 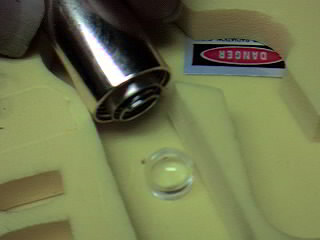 You can "adjust" the focus to close when you reassemble the laser optics. This can give a rather tight beam at close range of 2 to 3 feet. 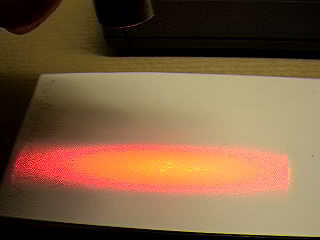 the beam spreads beyond that so as to limit the range of the laser. There is clearly more power out pouring from the laser now. 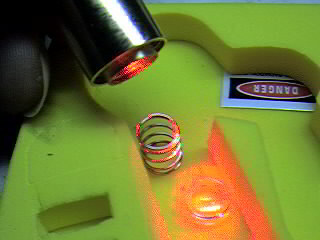 Applications such as optical computing uses spread beams like this. This is the beam of my specially modified wild wide open laser. The structures that once held the lens had been cut away so the full glory of the natural laser can issue forth. Back to Experiments page. Back to main page.